The 1982 box office hit, directed by horror maestro Tobe Hooper and "produced" by Stephen Spielberg (within a week of Spielberg's hit E.T) has thrilled audiences for over 3 decades. Having recently made the leap to Bluray it is a film that still has the capacity to move audiences to the edge of their seats. Considering the many films released currently (the Paranormal Activity franchise leaps into mind) and the vast gap in special effects technology it is worthy of note when a film is considered so effective. I think it is testament to the tight story telling and masterly direction from Hooper that we can attribute this success. Due to a clause in Spielberg's E.T contract (it stipulated that he couldn't direct any other film whilst preparing E.T) however Spielberg has been rumoured to be a lot more hands on than his producer credit would suggest. Whatever his involvement the team of Hooper and Spielberg really works. Poltergeist, for those of you who don't know, tells the story of the Freeling family living in a newly created estate (Cuesta Verde) Steven Freeling is a property developer for the company that is building the community whilst Diane cares for the couples three children, Dana, Robbie and Carol Anne (or Carol Ayyyyyaaaaannnn!) It is Carol Anne that becomes the focus or channel for the supernatural activity. This activity starts with a huge earthquake and burst of static through the families television to which Carol Anne announces the classic line "They're here!" Very quickly the seemingly benign spirits show their true purpose and the family are soon fighting for their very souls. Hooper is very deliberate in showing the audience that the Freeling family are a loving if supernaturally ignorant family (who really would allow their daughter to be slid across the floor by an unseen force and find this funny?) The house is haunted by more than one ghost and as the occurrences of activity escalate it becomes clear that Carol Anne is seen as the conduit into the human world. The revelation that the whole estate is built where an ancient cemetery was once found is not a new horror device. The twist that the company director, keen to save money, only moved the headstones is shocking. It explains the restless spirits determined to find their way to the light. Carol Anne reveals that another more malevolent demonic force is present, known as "The Beast", and is trying to manipulate the other spirits. After a successful, and highly gripping, rescue the medium (Tangina Barrons) proclaims the house to be "clean" The final scenes as the Freeling family flee their house are amazing. Gravestones force their way through the ground and The Beast makes one final attempt to force its way through. The house folds in on itself and implodes into another dimension. Now, any horror aficionado would cast an eye on my brief plot summary and would be forgiven in thinking there is nothing new or striking here. 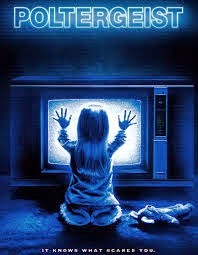 Certainly, poltergeist activity has been the focus of many horror films before and after this one. Some are more shocking (The Entity) than others which are very much tongue in cheek (High Spirits) What makes Poltergeist exceptional is that ALL of the elements are outstanding. Craig T. Nelson and JoBeth Williams are so believable as a couple trying to keep their very family from being ripped apart. 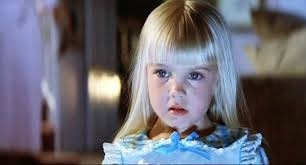 It is Heather O'Rourke that really is phenomenal with her portrayal of Carol Anne. Naive and childlike, as she should be, yet showing an incredible strength and fortitude that belies her few years. Jerry Goldsmith is on hand, again, to produce an amazing musical score. Whilst not as instantly recognisable as he work with The Omen, Goldsmith's score underpins the story without overwhelming it. I have said it before and its worth stating again here, in order to engage with a story the audience must be made to care about the main leads. Poltergeist just wouldn't work if the family dynamic wasn't as effective as it is here. The Freeling family are not struggling marital problems, here is a family that is successful, settled and working well. Poltergeist boasts some impressive special effect driven scenes. The sudden attack of the twisted, demonic tree which grabs Robbie still looks great. The use of striking bright light when Carol Anne is trapped in the alternative dimension also are striking especially when watched in High Definition. I have to be honest and say that the once scary and nightmare enducing "face ripping" scene looks very much like a tin of tomotoes is being poured down the sink. That said, the makeup is dramatic and Poltergeist won a BAFTA for special effects. Poltergeist also courted its fair share of controversy and is the subject of "the Poltergeist curse" this is alleged to be in place because JoBeth Williams was quoted in saying the production used real skeletons. The rumours of a curse are given more weight with the tragic death of child star O'Rourke. In reality O'Rourke died of a cardiac arrest brought on by septic shock. The death may have been attributed to the curse as she tragically passed away some three months before Poltergeist 3 was released. 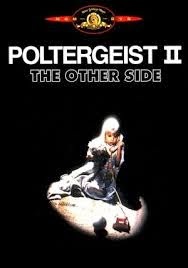 Poltergeist II-The Other Side focused on the same family some four years after the events in the first film. Whilst not as financially successful as its predecessor it was by no means a box office flop. Again, focusing on an attack by a supernatural entity and again Carol Anne is the focus of the spirits attentions. There is much to enjoy here! 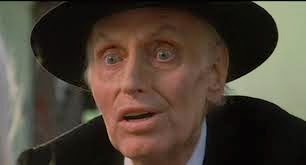 The character of the Reverend Kane is truly terrifying as he attempts to prevent the dead from passing on. Kane's interactions with the family (of note is his visit to their house whilst singing the gospel classic "God is in His holy temple") still chill. Not so effective is the scene in which Kane possesses a Mezcal Worm (found in Tequila) and is swallowed by Steven. Compared to the original Poltergeist, Poltergeist II just doesn't work to the same level. Although by no means a bad film it suffers from the law of diminishing returns and, certainly, by Poltergeist 3, the franchise was on a downward spiral. With the franchise rebooted and due next year it is my hope that the films production values keep to the quality of the original. Too many times we have seen great films updated for a new generation but in the process they lose their soul. Perhaps that is the price that is paid for CGI effects, perhaps Im just an older generation horror fan, who knows? I champion a return to great film making rather than a focus on quick, easy money making films which betray the very audiences that keep the wheels oiled.